This relationship brings together, under one roof, High Pressure Processing Tolling Services, 3rd Party Commissary Services, and 3rd Party Cold Press Juice Line. High Pressure Pasteurization (HPP) is a newer technology that has gained rapid adoption globally to assist food manufacturers and distributors in achieving an extension of shelf life of all natural products. During the High Pressure Pasteurization, all natural food products such as a juice are submerged in water and then subjected to incredible water pressure. Under the intense pressure, the spoilage microbes are drastically reduced. The end result is a shelf life extension of between 2x and 3x the natural shelf life of the product in its natural state. High Pressure Processing has been the driver behind the large variety of All Natural products, such as Cold Press Juice, Salsa, Hummus, Salad Dressing, and much more, entering into the mainstream grocery chain. When HPP first became available, only the very large food processing companies could afford to purchase and maintain the equipment necessary for the process. Ten years ago, a company by the name of American Pasteurization Company (APC) started offering High Pressure Processing (HPP) on a commercial tolling basis to the food manufacturing industry. This next phase allowed smaller food manufacturing companies to utilize HPP, as well as the larger companies that wanted to test the waters before making the commitment to bring HPP In-House. Today, there are several tolling centers spread across the United States that offer to HPP Services "as pay as you go" basis, post-application packaging, temporary storage and distribution services for food manufacturers. "HPP Detroit will be a NEXT HPP Showcase for the Midwest United States, based in the Metro Detroit Market," states Gerald Ludwick, Director for NEXT HPP. “We have committed to provide two Integrated NEXT Generation 350L machines for delivery in the next six to eight Months." HPP Detroit's model is very unique, allowing for internal customers to utilize HPP, as well as external tolling customers. The facility will have capabilities for 3rd Party commissary food processing and 3rd Party cold press juices. “Over the last six months we been working with several companies that are looking for a one stop location, where they can have the product produced, the product High Pressure Processed and prepared for market,” stated Keith Sirois, Managing Partner HPP Detroit. “We were attracted to the NEXT HPP platform, as it provides for online loading of product into the HPP baskets at our production lines. We will be offering baskets and pallets solutions for our external customers, as well so that we eliminate any double handling of product." 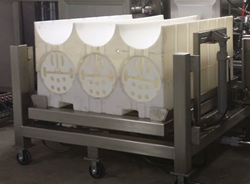 NEXT HPP’s Auto Load and Unload Platform, utilizes a Patented Palleting System that stores 6 baskets to a pallet. Pallets can be stacked two pallets high with a maximum of 32 pallets and 192 baskets onto a refrigerated truck. HPP Detroit's Tolling Model allows customers to drop off pallets at a designated time and then reload in the same trip, thus eliminating costly transportation expense. Those who want to find out more about NEXT HPP, CLICK HERE! Those who want to find out more about HPP Detroit, CLICK HERE! Next HPP is small, nimble, and unique company that can quickly respond to this rapidly changing industry. We design to the unanswered current and future needs of the industry. All NEXT HPP machines come standard with automatic loading and unloading, tractability, reporting, intuitive preventive maintenance, and simplicity. Service is paramount and we’ve designed non-proprietary parts at every turn. We focus on local support, where you live and work.